Tocatì - Festival Internazionale dei Giochi in Strada, Verona, Italy. Information, Photos and Reviews. Tocatì, organized by Ancient Games’ Association with the Culture Department of Verona’s Council, is a festival based on traditional games as part of the Unesco Intangible Cultural Heritage (2003). 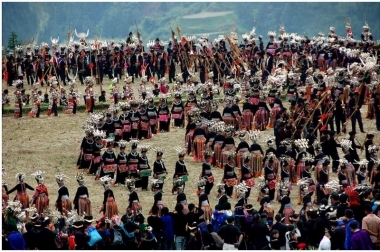 This year they o er a journey to discover the culture and traditions of four provinces in China (Beijing, Guizhou, Shanxi and Shenzhen) through games, music and dances. In Verona’s historical center, void of cars, the protagonists are 40 traditional games, both Chinese and Italian, who’ll tell the story and the contemporariness of the regions they come from. Then there’s the “children area” with many interesting and fun activities, the stages at China Square and at the Adige embankment, the installations, the exhibitions, the projections of documentaries, the cultural meetings and the conferences in the rooms and Auditorium of the Forum of Ludic Culture which o er many occasions to expand on ludic subjects. It's a unique occasion to discover the values and liveliness of traditional games in today’s society. Come play with us! Nobody has reviewed Tocatì - Festival Internazionale dei Giochi in Strada yet, Be the first. You are submitting a booking enquiry. Tocatì - Festival Internazionale dei Giochi in Strada will then contact you by email with details of availability and prices.